EMC is buying cloud storage gateway software biz Maginatics, as predicted, but also plans to buy startup Spanning, which makes cloud-to-cloud data protection technology. Maginatics is heading for EMC's Core Technology Division and the background about its products and capabilities can be read here. Jeff Erramouspe became its CEO and president in November 2013. Spanning says it provides full data recovery for the complete Google Apps suite: Gmail, Drive, Sites, Calendar and Contacts with its Spanning Backup product. EMC's Russ Stockdale, a vice president for Backup Recovery Systems at EMC, blogs that Spanning delivers protection for “born in the cloud” apps which are "becoming more commonplace within the workplace, and the critical data they create is often beyond the reach of traditional data protection strategies. 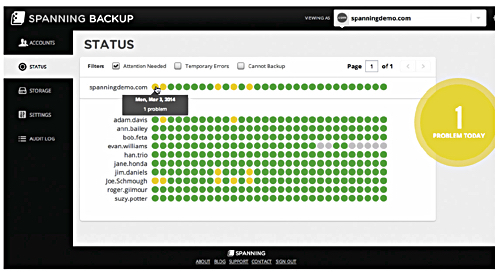 Spanning is available for EMC customers today." As for Maginatics: "By providing a single protection namespace in the cloud – and a separate, single metadata DB across clouds – Maginatics enables EMC customers to extend their data protection architecture to the cloud with unified management and analytics across all protected content, regardless of whether it resides on-premise or in the cloud." Stockdale adds: "It will also enable our customers to choose the storage cloud that best fits their needs, or choose multiple clouds based on their applications and geography with a single, unified protection management environment. Look for new EMC services based on Maginatics technology in 2015." Will EMC integrate Maginatics and Spanning with its other data protection products? Watch this space.